Asthma and allergic disease result from complex environmental and genetic interactions. These factors have been identified by epidemiological studies, randomized prevention trials, and animal models. Vitamin E is one of the environmental factors that can regulate responses to challenge with allergens. 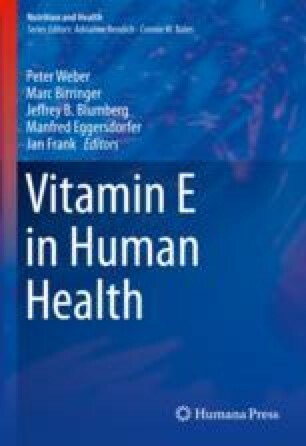 Reports for vitamin E have seemingly varied outcomes regarding benefits of vitamin E, but these differences are consistent with the differential functions of the isoforms of vitamin E. Mechanistic studies have identified opposing functions of the vitamin E isoforms α-tocopherol and γ-tocopherol. Moreover, differences in global prevalence of asthma may be an outcome, at least in part, of differences in amount of isoforms of tocopherols. In order to interpret human and preclinical studies, reports need to include measurements of the tocopherol isoforms in the treatments, in vehicles for the treatments, and in the plasma and/or tissues before and after intervention. Studies of differential regulation of inflammation by tocopherol isoforms provide a foundation for development of interventions to improve lung function in disease and raise the possibility of early life dietary interventions to limit the development of lung disease. Sources of Support: This study was supported by National Institutes of Health Grants R01AI127695, U01AI131337, and R01 AT004837. CDC National Asthma Control Program. http://www.cdc.gov/asthma/impacts_nation/asthmafactsheet.pdf (2012). Center For Disease Control Report. http://www.cdc.gov/nchs/data/databriefs/db121.pdf (2013).